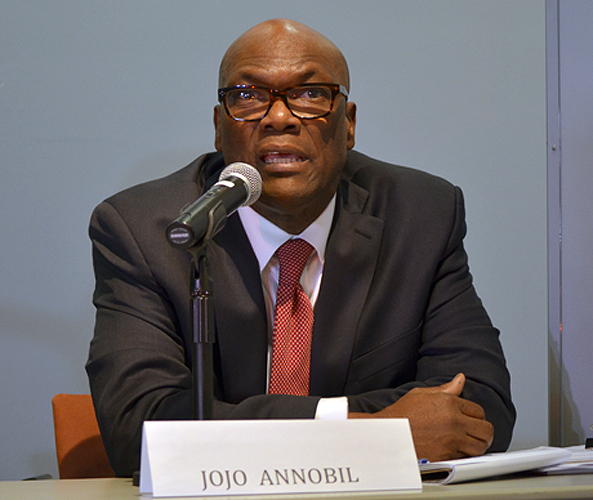 The following passage is edited for context, accuracy and clarification for comments by Jojo Annobil, Executive Director, Immigrant Justice Corps, at the CUNY J-School forum, November 21. One-point-nine million of the undocumented population have lived in this country for 20 years or more, 6.6 (million) have lived in this country for at least 10 years or more. They are enmeshed in the system. Former Mayor Bloomberg once said that his people came here illegally. When they got here, employers hired them even though they were not supposed to. But if they hadn’t, the economy in New York City wouldn’t (had) move. It wouldn’t be what it is. If you take those people out of the system, the economy will break down. The ultimate goal, the ultimate goal is to fix the broken immigration laws. That is the ultimate goal. That is the root cause of where we are now, and we have to keep our eyes on that prize. President-elect Donald Trump’s ranting early in his campaign about his plans to deport 11 million undocumented immigrants, to withhold federal funds from sanctuary cities, and the threats, along with numerous racist and rancid comments about Mexicans and Muslims, reverberated throughout the nation. NYC Immigrants Fear Trump Will Send America’s Deportation Machine Into Overdrive, was the November 15 headline of one gothamist.com story. His word, literally, or his word, figuratively? Trump’s hyperbole ranges widely and the mainstream corporate news media heavy weights, who like to portray themselves as America’s watchdogs, have done a poor job holding him accountable for his choice of words. So, what can New York City’s immigrant communities do to prepare for the policies of, and to make sense of, the statements by the President-elect of the United States who has been described as a racist, sexist, demagogue, nativist and birther? 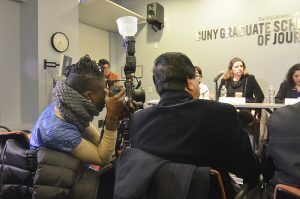 At a November 21 forum organized by CUNY’s Center for Community and Ethnic Media, panelists provided information about the legal protections and rights of immigrants and details so that New York City’s immigrant communities can cope with new pressures or challenges that may arise under the incoming Trump administration. Topics included sanctuary cities, keeping data about immigrants safe, how immigrants can protect themselves in case of a raid, visa options that may not have been explored, and responding to a possible reversal of President Obama’s 2012 executive order, Deferred Action for Childhood Arrivals and resources for legal aid. 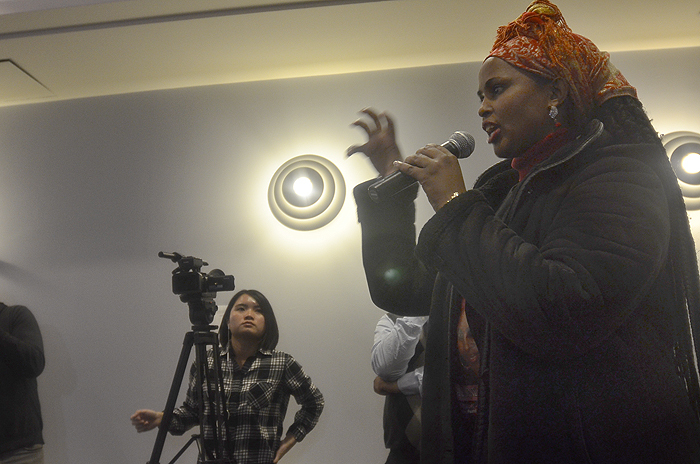 A journalist asking a question of the panel. The panelists were Nisha Agarwal, Commissioner, Mayor’s Office of Immigrant Affairs; Camille J. Mackler, Director of Legal Initiatives, New York Immigration Coalition; Alina Das, Co-Director, Immigrant Rights Clinic, New York University School of Law; Alizabeth Newman, Director, Immigrant Initiatives, CUNY Law School, and Jojo Annobil, Executive Director, Immigrant Justice Corps. 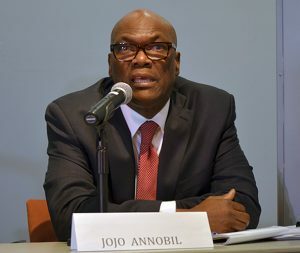 Two in particular, Alizabeth Newman and Jojo Annobil, directly addressing the contagion of fear caused by Trump’s comments, said that immigrant communities should not let irrational fear effect their lives. Trump’s vitriolic comments distracted attention from realities. For example, New York City regales in its status as a Sanctuary City and organizations and institutions and government services are in place to assist undocumented residents. Sanctuary cities have policie protecting undocumented immigrants, such as not prosecuting them solely for violating federal immigration laws. So, said, Alizabeth Newman at the forum attended by scores of reporters from ethnic news media, don’t panic irrationally. “People can’t stop living and should not stop living,” she said. 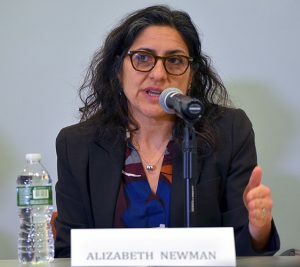 Said Annobil of the Immigrant Justice Corps, “When we say let’s calm down, we are talking from experience and knowing the systems in place.” But he said he recognized, as did Newman, that “unfortunately,” the immigrant on the ground doesn’t know that. “But as a practical matter, what can really be done,” she said rhetorically, meaning that the President-elect made statements that were unrealistic. “I think we’ve already started to see some change after the election in the practicalities of, well, how (something) is going to implement? Everything from building the wall around the entire border came to well, maybe” he might build “a fence here and there.” The realities of the cost and time for building the wall that he regularly boasted about are impractical, she said. “I think we need to wait and see, and I think we need to take advantage of the wonderful opportunities that the city is making available for people who are concerned to come and get some very specific legal counsel that is particular to their family and what options they might be able to take,” she said. Gregg Morris can be reached at gmorris@hunter.cuny.edu.